Law of the Somalis is one of various text layout/formatting and index projects done for the sister companies, Africa World Press and The Red Sea Press, Trenton New Jersey. The books of the projects are all available for order on the companies’ website- http://www.africaworldpressbooks.com/servlet/StoreFront and all major online retail stores including amazon.com and Barnes and Noble. Written by a trained and sympathetic observer, this book shows how Somali customary law differs fundamentally from most statutory law. Lawbreakers, instead of being punished, are simply required to compensate their victim. Because every Somali is insured by near kin against his or her liabilities under the law, a victim seldom fails to receive compensation. Somali law, being based on custom, has no need of legislation or legislators. It is therefore happily free of political influences. The author notes some specific areas that stand in need of change, but finds such change already implicit in further economic development. Somali politics is based on consensus. The author explains how it works and shows why any attempt to establish democracy, which would divide the population into two classes-those who rule and those who are ruled-must inevitably produce chaos. Viewed in global perspective, Somali law stands with the Latin and Medieval laws and the English common law against the statutory law that became prominent in Europe with the modern nation-state. 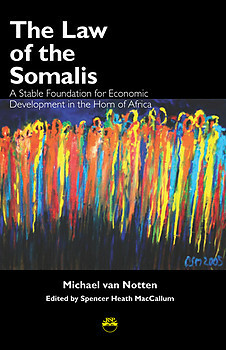 This book explains many seeming anomalies about present-day Somalia and describes its prospects as well as the dangers facing it. Born in Zeist, the Netherlands, MICHAEL VAN NOTTEN (1933-2002) graduated from Leiden University in Law and was admitted into practice in Rotterdam. Following the demise of central government in Somalia, he anticipated that Somalia might take its place in the world as a stateless society. Marrying into the Samaron clan, he promoted economic development in Awdal for the last twelve years of his life. He became a careful observer of Somali customary law and a keen analyst of the intricacies of clan politics. SPENCER HEATH MACCALLUM is a social anthropologist living in Casas Grandes, Chihuahua, Mexico where he played a central role in the economic development of the village of Mata Ortiz, known internationally for its fine-art pottery. Author of The Art of Community and a former real-estate analyst, he has long studied the feasibility of urban communities without taxes. 5 ½ X 8 ½ Manufacturer: The Red Sea Press, Inc.